Account Sales Manager is responsible for creating and developing a long-term relationship with present customers, attracting new customers and overseeing sales. 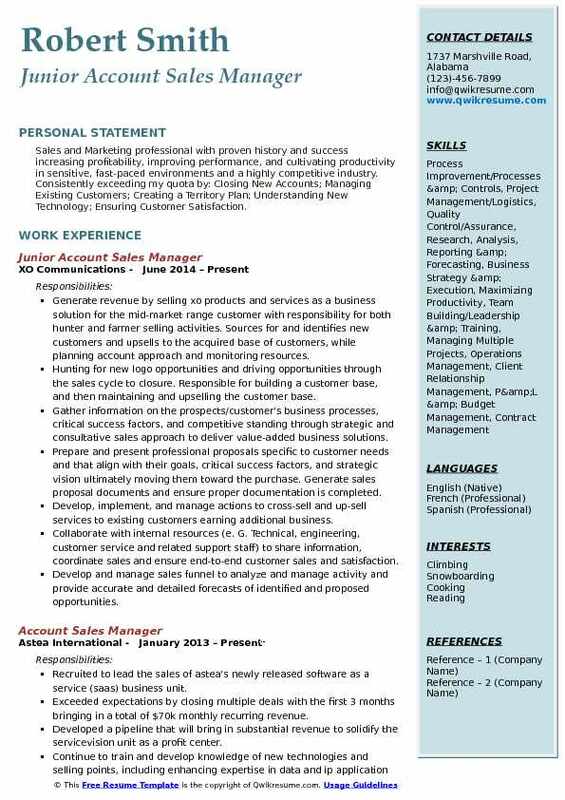 Typical Account Sales manager Resume sample showcase some duties like maintaining customer database, managing portfolios, generating new sales, responding to inquiries, training new employees on sales strategies, developing sales techniques, supervising account representatives, delivering reports of various accounts, liaison between company and customer and satisfying their needs, suggesting strategies to enhance sales and to identify growth opportunities. To become an Account Sales Manager, one must possess excellent networking, self-motivation, professionalism, and organizational skills. Most of the employers prefer a Bachelors degree or an Associate degree in fields like Marketing, sales management or Finance for Account Sales Manager position. 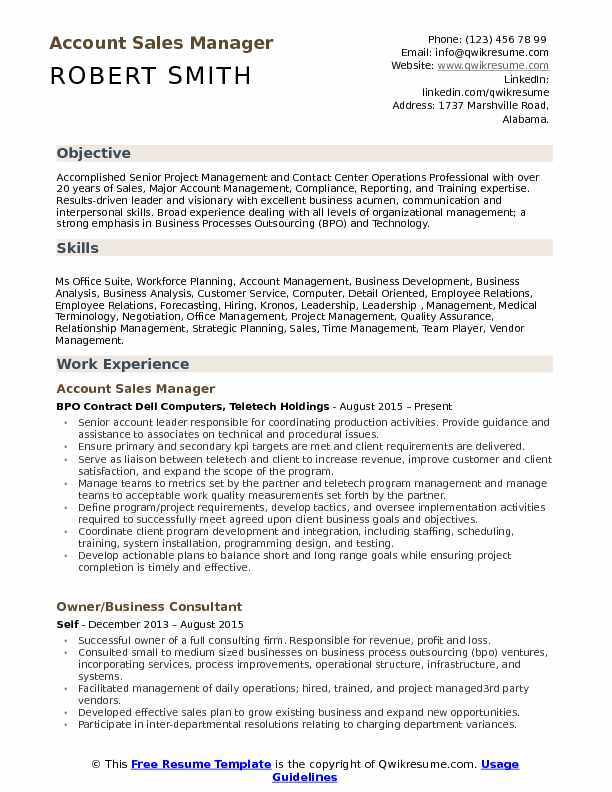 Summary : Accomplished Senior Project Management and Contact Center Operations Professional with over 20 years of Sales, Major Account Management, Compliance, Reporting, and Training expertise. Results-driven leader and visionary with excellent business acumen, communication and interpersonal skills. Broad experience dealing with all levels of organizational management; a strong emphasis in Business Processes Outsourcing (BPO) and Technology. Skills : Ms Office Suite, Workforce Planning, Account Management, Business Development, Business Analysis, Business Analysis, Customer Service, Computer, Detail Oriented, Employee Relations, Employee Relations, Forecasting, Hiring, Kronos, Leadership, Leadership , Management, Medical Terminology, Negotiation, Office Management, Project Management, Quality Assurance, Relationship Management, Strategic Planning, Sales, Time Management, Team Player, Vendor Management. Senior account leader responsible for coordinating production activities. Provide guidance and assistance to associates on technical and procedural issues. Ensure primary and secondary kpi targets are met and client requirements are delivered. Serve as liaison between teletech and client to increase revenue, improve customer and client satisfaction, and expand the scope of the program. Manage teams to metrics set by the partner and teletech program management and manage teams to acceptable work quality measurements set forth by the partner. Define program/project requirements, develop tactics, and oversee implementation activities required to successfully meet agreed upon client business goals and objectives. Coordinate client program development and integration, including staffing, scheduling, training, system installation, programming design, and testing. Develop actionable plans to balance short and long range goals while ensuring project completion is timely and effective. Ensure non-compliances receive a corrective action plan and communicate to client. Document all meetings/conversations with teletech departments and client. 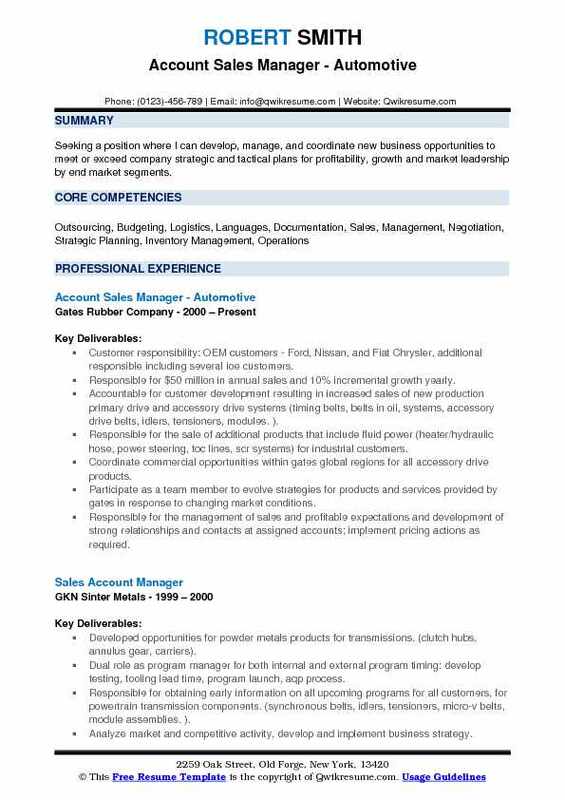 Summary : Seeking a position where I can develop, manage, and coordinate new business opportunities to meet or exceed company strategic and tactical plans for profitability, growth and market leadership by end market segments. Customer responsibility: OEM customers - Ford, Nissan, and Fiat Chrysler, additional responsible including several ioe customers. Responsible for $50 million in annual sales and 10% incremental growth yearly. Accountable for customer development resulting in increased sales of new production primary drive and accessory drive systems (timing belts, belts in oil, systems, accessory drive belts, idlers, tensioners, modules. ). Responsible for the sale of additional products that include fluid power (heater/hydraulic hose, power steering, toc lines, scr systems) for industrial customers. Coordinate commercial opportunities within gates global regions for all accessory drive products. Participate as a team member to evolve strategies for products and services provided by gates in response to changing market conditions. Responsible for the management of sales and profitable expectations and development of strong relationships and contacts at assigned accounts; implement pricing actions as required. 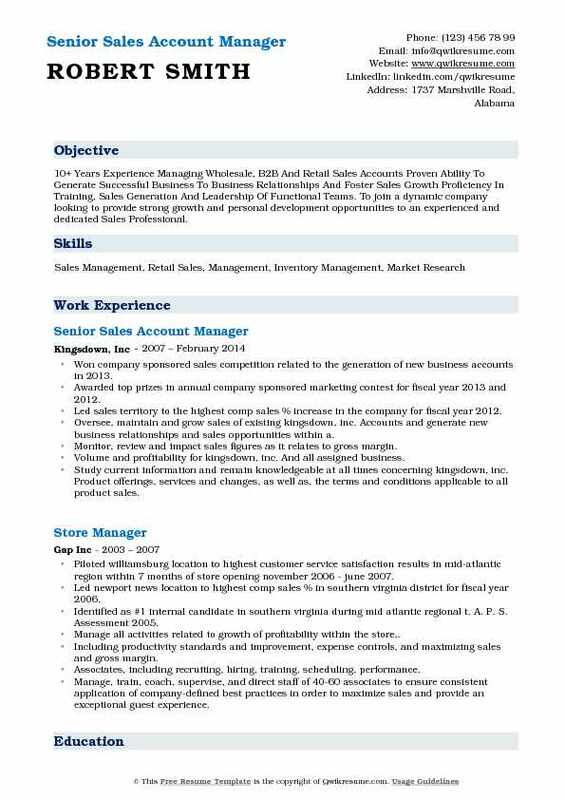 Summary : Account manager successful in building a loyal customer base to exceed sales goals. An expert in the flexible packaging industry, servicing converters, end-users, and industrial markets. Skilled in product development, customer assessment, and the qualification process. International experience includes marketing global film alternatives and packaging solutions. Skills : strong client relations, domestic and international experience, industry networking, cold calling, and creative problem solving. 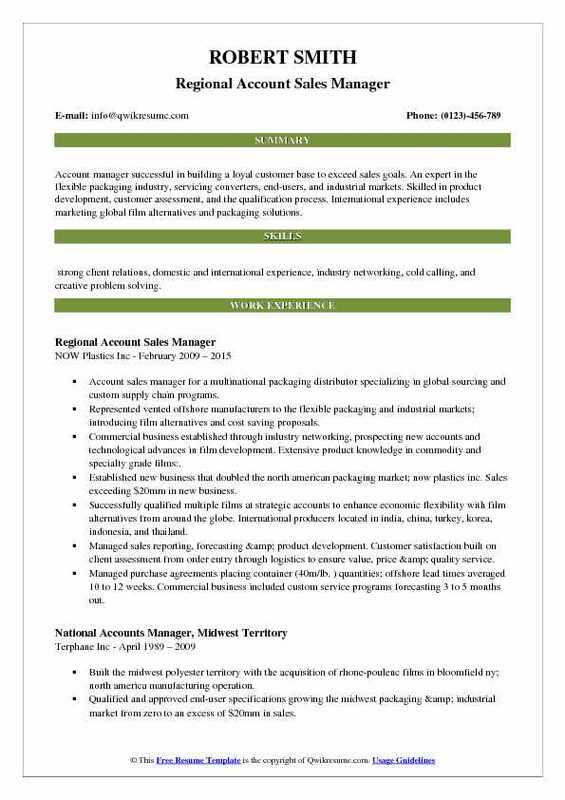 Account sales manager for a multinational packaging distributor specializing in global sourcing and custom supply chain programs. Represented vented offshore manufacturers to the flexible packaging and industrial markets; introducing film alternatives and cost saving proposals. Commercial business established through industry networking, prospecting new accounts and technological advances in film development. Extensive product knowledge in commodity and specialty grade films:. Established new business that doubled the north american packaging market; now plastics inc. Sales exceeding $20mm in new business. Successfully qualified multiple films at strategic accounts to enhance economic flexibility with film alternatives from around the globe. International producers located in india, china, turkey, korea, indonesia, and thailand. Managed sales reporting, forecasting & product development. Customer satisfaction built on client assessment from order entry through logistics to ensure value, price & quality service. Managed purchase agreements placing container (40m/lb. ) quantities; offshore lead times averaged 10 to 12 weeks. Commercial business included custom service programs forecasting 3 to 5 months out. Headline : Executive position leading corporate strategy, development and relationship management/project management, community relations, public & government affairs. 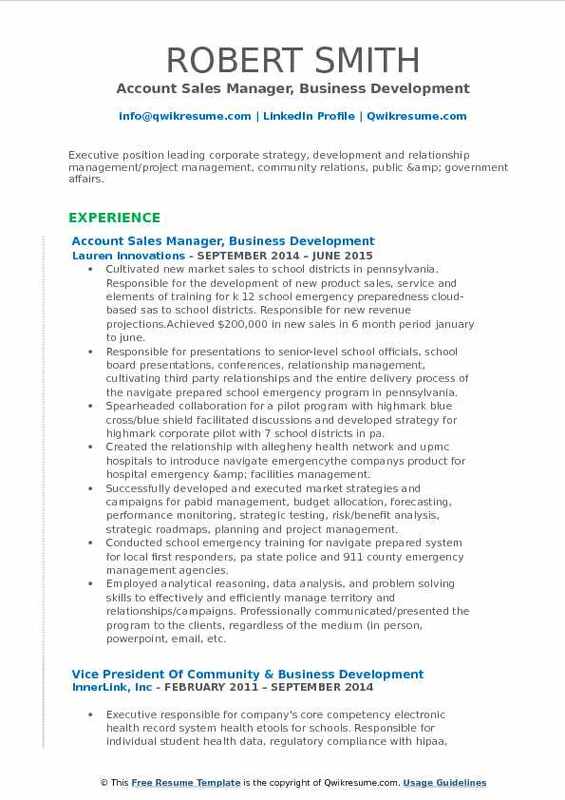 Cultivated new market sales to school districts in pennsylvania. Responsible for the development of new product sales, service and elements of training for k 12 school emergency preparedness cloud-based sas to school districts. Responsible for new revenue projections.Achieved $200,000 in new sales in 6 month period january to june. Responsible for presentations to senior-level school officials, school board presentations, conferences, relationship management, cultivating third party relationships and the entire delivery process of the navigate prepared school emergency program in pennsylvania. Spearheaded collaboration for a pilot program with highmark blue cross/blue shield facilitated discussions and developed strategy for highmark corporate pilot with 7 school districts in pa. Created the relationship with allegheny health network and upmc hospitals to introduce navigate emergencythe companys product for hospital emergency & facilities management. Successfully developed and executed market strategies and campaigns for pabid management, budget allocation, forecasting, performance monitoring, strategic testing, risk/benefit analysis, strategic roadmaps, planning and project management. Conducted school emergency training for navigate prepared system for local first responders, pa state police and 911 county emergency management agencies. 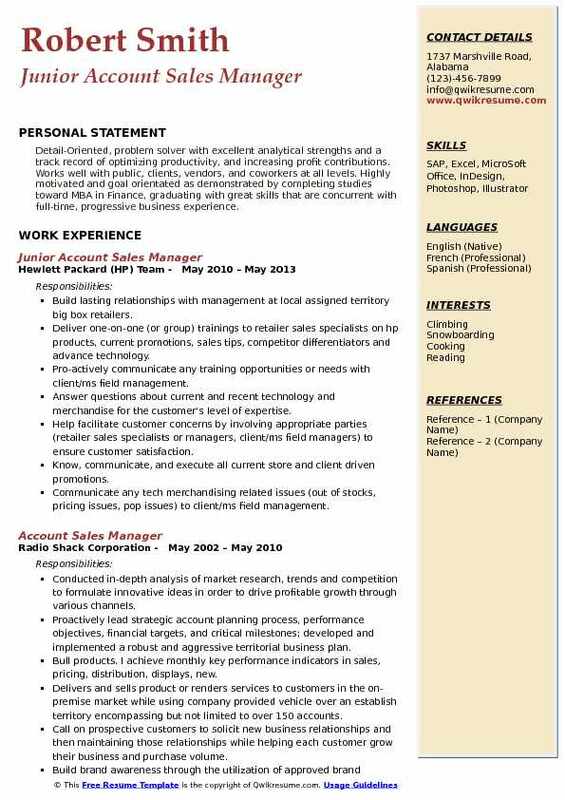 Employed analytical reasoning, data analysis, and problem solving skills to effectively and efficiently manage territory and relationships/campaigns. Professionally communicated/presented the program to the clients, regardless of the medium (in person, powerpoint, email, etc. Demonstrated thought leadership and professional communication skills by developing and delivering client facing materials, such as presentations, point of views, business cases and performance reports. Objective : Sales and Marketing professional with proven history and success increasing profitability, improving performance, and cultivating productivity in sensitive, fast-paced environments and a highly competitive industry. Consistently exceeding my quota by: Closing New Accounts; Managing Existing Customers; Creating a Territory Plan; Understanding New Technology; Ensuring Customer Satisfaction. Generate revenue by selling xo products and services as a business solution for the mid-market range customer with responsibility for both hunter and farmer selling activities. Sources for and identifies new customers and upsells to the acquired base of customers, while planning account approach and monitoring resources. Hunting for new logo opportunities and driving opportunities through the sales cycle to closure. Responsible for building a customer base, and then maintaining and upselling the customer base. Gather information on the prospects/customer's business processes, critical success factors, and competitive standing through strategic and consultative sales approach to deliver value-added business solutions. Prepare and present professional proposals specific to customer needs and that align with their goals, critical success factors, and strategic vision ultimately moving them toward the purchase. Generate sales proposal documents and ensure proper documentation is completed. Develop, implement, and manage actions to cross-sell and up-sell services to existing customers earning additional business. Collaborate with internal resources (e. G. Technical, engineering, customer service and related support staff) to share information, coordinate sales and ensure end-to-end customer sales and satisfaction. Develop and manage sales funnel to analyze and manage activity and provide accurate and detailed forecasts of identified and proposed opportunities. Summary : 10+ Years Experience Managing Wholesale, B2B And Retail Sales Accounts Proven Ability To Generate Successful Business To Business Relationships And Foster Sales Growth Proficiency In Training, Sales Generation And Leadership Of Functional Teams. To join a dynamic company looking to provide strong growth and personal development opportunities to an experienced and dedicated Sales Professional. Won company sponsored sales competition related to the generation of new business accounts in 2013. Awarded top prizes in annual company sponsored marketing contest for fiscal year 2013 and 2012. Led sales territory to the highest comp sales % increase in the company for fiscal year 2012. Oversee, maintain and grow sales of existing kingsdown, inc. Accounts and generate new business relationships and sales opportunities within a. Monitor, review and impact sales figures as it relates to gross margin. Volume and profitability for kingsdown, inc. And all assigned business. Study current information and remain knowledgeable at all times concerning kingsdown, inc. Product offerings, services and changes, as well as, the terms and conditions applicable to all product sales. Extensive travel as required for all business to business affairs, including the attendance of yearly trade shows to promote sales of kingsdown,. 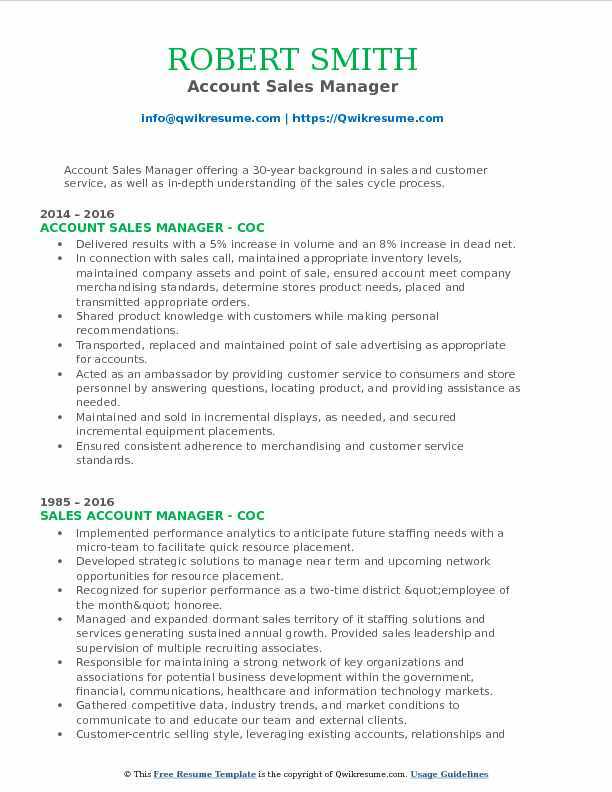 Summary : Account Sales Manager offering a 30-year background in sales and customer service, as well as in-depth understanding of the sales cycle process. Delivered results with a 5% increase in volume and an 8% increase in dead net. In connection with sales call, maintained appropriate inventory levels, maintained company assets and point of sale, ensured account meet company merchandising standards, determine stores product needs, placed and transmitted appropriate orders. Transported, replaced and maintained point of sale advertising as appropriate for accounts. Acted as an ambassador by providing customer service to consumers and store personnel by answering questions, locating product, and providing assistance as needed. Maintained and sold in incremental displays, as needed, and secured incremental equipment placements. Ensured consistent adherence to merchandising and customer service standards. 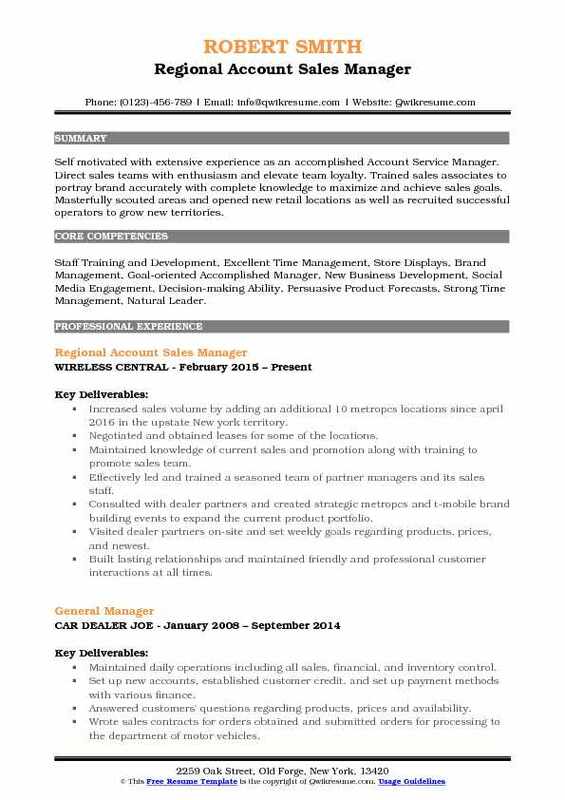 Summary : Self motivated with extensive experience as an accomplished Account Service Manager. Direct sales teams with enthusiasm and elevate team loyalty. Trained sales associates to portray brand accurately with complete knowledge to maximize and achieve sales goals. Masterfully scouted areas and opened new retail locations as well as recruited successful operators to grow new territories. 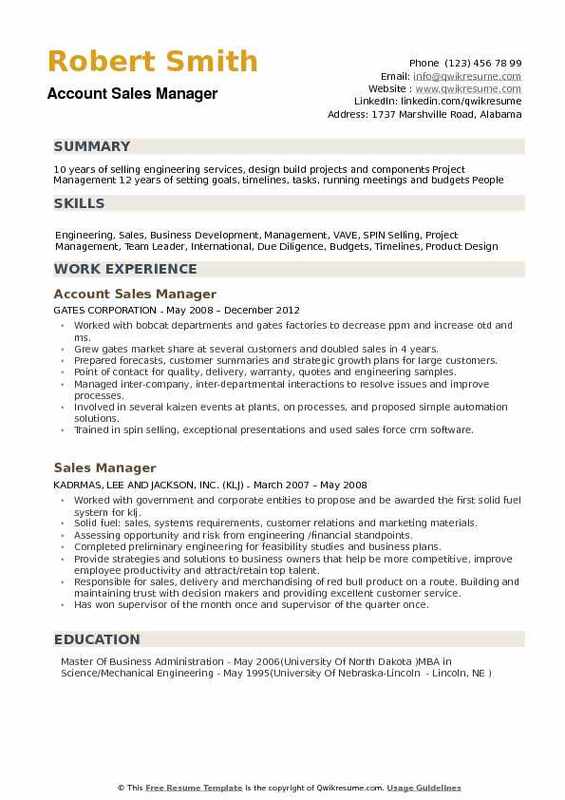 Skills : Staff Training and Development, Excellent Time Management, Store Displays, Brand Management, Goal-oriented Accomplished Manager, New Business Development, Social Media Engagement, Decision-making Ability, Persuasive Product Forecasts, Strong Time Management, Natural Leader. Increased sales volume by adding an additional 10 metropcs locations since april 2016 in the upstate New york territory. Negotiated and obtained leases for some of the locations. Maintained knowledge of current sales and promotion along with training to promote sales team. Effectively led and trained a seasoned team of partner managers and its sales staff. Consulted with dealer partners and created strategic metropcs and t-mobile brand building events to expand the current product portfolio. Visited dealer partners on-site and set weekly goals regarding products, prices, and newest. Built lasting relationships and maintained friendly and professional customer interactions at all times. Created and generated quarterly success, forecasting, sales and progress reporting in all accounts. Objective : Detail-Oriented, problem solver with excellent analytical strengths and a track record of optimizing productivity, and increasing profit contributions. Works well with public, clients, vendors, and coworkers at all levels. Highly motivated and goal orientated as demonstrated by completing studies toward MBA in Finance, graduating with great skills that are concurrent with full-time, progressive business experience. Build lasting relationships with management at local assigned territory big box retailers. Deliver one-on-one (or group) trainings to retailer sales specialists on hp products, current promotions, sales tips, competitor differentiators and advance technology. Pro-actively communicate any training opportunities or needs with client/ms field management. Answer questions about current and recent technology and merchandise for the customer's level of expertise. Help facilitate customer concerns by involving appropriate parties (retailer sales specialists or managers, client/ms field managers) to ensure customer satisfaction. Know, communicate, and execute all current store and client driven promotions. Communicate any tech merchandising related issues (out of stocks, pricing issues, pop issues) to client/ms field management. Worked with bobcat departments and gates factories to decrease ppm and increase otd and ms. Grew gates market share at several customers and doubled sales in 4 years. Prepared forecasts, customer summaries and strategic growth plans for large customers. Point of contact for quality, delivery, warranty, quotes and engineering samples. Managed inter-company, inter-departmental interactions to resolve issues and improve processes. Involved in several kaizen events at plants, on processes, and proposed simple automation solutions. Trained in spin selling, exceptional presentations and used sales force crm software.